The rise of illegal downloading has been good for the music scene, helping to create a generation of exciting new acts, according to US band Fleet Foxes. File-sharing has been the scourge of record labels for the past decade. 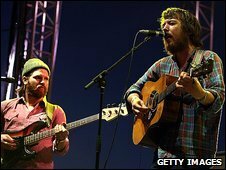 But singer Robin Pecknold said it had made it easier for musicians, including him, to discover lots of classic music that has influenced and inspired them. "As much music as musicians can hear, that will only make music richer as an artform," Pecknold told BBC News. "I think we're seeing that now with tons of new bands that are amazing, and are doing way better music now than was being made pre-Napster." The original Napster launched in June 1999 and became the first mass file-sharing service, sparking an ongoing battle between the music industry and popular but unlicensed song services. Brian Wilson's Smile and The Zombies' Odessey and Oracle were among the albums he discovered through the service, he said. Record companies argue that piracy means people buy less music, which in turn means the labels have less money to spend on developing new acts. The music industry has been hit hard in the last 10 years, with global album sales down more than 50% since 1999 - and the blame largely aimed at file-sharing. But Pecknold said he did not object to file-sharing. "I've downloaded hundreds and hundreds of records - why would I care if somebody downloads ours? That's such a petty thing to care about. "I mean, how much money does one person need? I think it's disgusting when people complain about that, personally." Fleet Foxes' self-titled debut album was released last June and was named best album of 2008 by Billboard, The Times, Mojo, Pitchfork and Uncut. The harmonic Seattle folk rock five-piece also earned two Brit Award nominations at the start of the year. Their slow-burning success continued as the album peaked at number three in the UK chart in February. On Thursday, the group beat Leonard Cohen and Radiohead to be named best live act at the Mojo magazine awards in London.